A metahuman criminal with a destructive touch has been methodically killing people all around Central City. As Team Flash steps in to deal with him, the killer sets his sites on Joe West. Unfortunately, it's Iris who winds up in the crossfire! The Flash comics of Cary Bates and Mark Waid. Iris has undergone a complete 180 since last week, going from being more afraid of not living her life well before dying to being deeply afraid of dying. How can Joanie Horton say that Kid Flash is the one thing she misses about Central City when Kid Flash first appeared after she left for college? Why don't the bullets Joe shoots at Clive penetrate his clothes? While Cisco's idea to use focused cold to slow the decay of Iris' body is brilliant, his analogy is terrible. The decay of bananas is hastened by cold temperatures - not slowed. Jesse L. Martin doesn't always get the best-written speeches but damned if he doesn't sell the hell out of Joe's sense of betrayal when he finds out that he wasn't told about Iris's impending death. Once again, the odd relationship that is slowly developing between Caitlin and Julian is the high-point of the episode's subplots. Kudos to Tom Felton and Danielle Panabaker for two subtle performances. It's a brief thing, but Keiynan Lonsdale has some great non-verbal reactions in the scene where Kid Flash confronts Clive Yorkin after Barry phases the train. Good special effects on the sequence when Joe shoots at Clive. There's some great direction and blocking, with reoccurring images of lower arms being gripped - both as a prelude to attack and as a means of comfort. 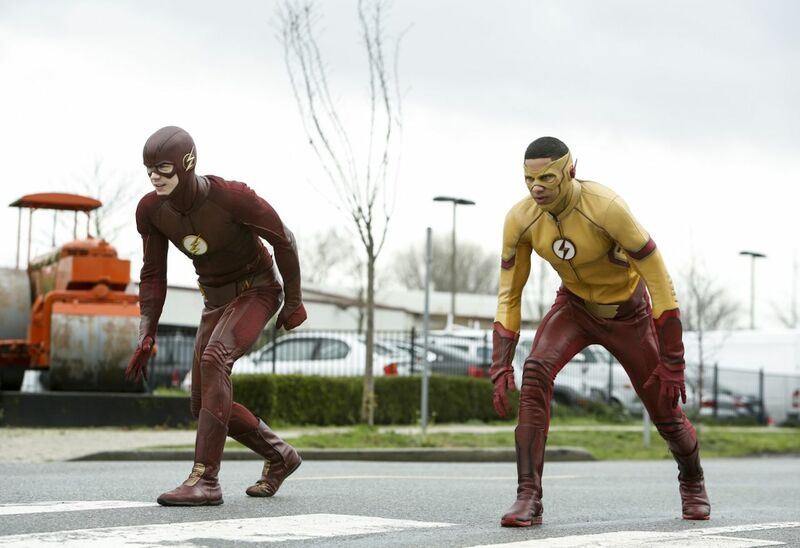 The episode opens with Barry and Wally racing each other as part of Wally's training. Speedsters racing each other has a long tradition in the various Flash comics. In the comics, different speedsters have different tricks they can manage that other speedsters can't. Wally's difficulty in phasing through solid matter is a reference to that. In the original comics, Wally West - at one point - was unable to phase through solid matter without making it explode. Clive Yorkin first appeared in The Flash #270 (February 1979). A career criminal with multiple life sentences for murder and robbery, he agreed to be part of an experimental procedure that would "cure" him of his desire to do bad things. The process failed, driving Yorkin insane as his pain and pleasure responses were reversed and he developed the power to kill people by touching them. Curiously, Clive Yorkin was believed to have killed Iris West. It was later shown, however, that she was killed by The Revese Flash, who was moving at super-speed. The DCTVU version of Clive Yorkin differs from his comics counterpart in that his touch causes matter to decay rapidly. He touches a table and causes it to disintegrate in seconds and the bullets Joe shoots at him dissolve on contact. This version of Clive Yorkin also seems to have some fine control over his power - otherwise he wouldn't be able to wear clothes - and he is able to turn the power off so he can touch objects without destroying them. We see this when he is drinking from a coffee cup while stalking Laura Stone. The lounge singer we see Clive Yorkin attack is named Julio Mendez. Julio Mendez was the name of Barry Allen's co-worker in the CCPD crime lab in the 1990's The Flash TV series. Captain Julio Mendez was Barry's boss in the Flashpoint reality. All three roles are played by actor Alex Désert. Barry using his speed to phase through solid matter is a classic Flash trick and Wally West was able to increase or decrease the speed of objects in motion by leaching their speed through The Speed Force or lending his own speed to them. To the best of my knowledge, however, the trick where Barry makes a train intangible in this episode is the first instance in any medium of any version of The Flash making a large object intangible by lending it his speed. The theory is sound, however, by the standards of comic book science. When placing bets on the Flash/Kid Flash race, Caitlin declares that her winnings will be going to a new confocal microscope. STAR Labs has a 3-D image medical scanner. Quebracho is a Spanish word used to refer to a number of hard-wooded species of tree native to South America. It literally translates as "ax-breaker." Cisco constructs a wall of double-reinforced quebracho to train Wally in phasing through solid matter. After 8 hours, the victim of the death touch resembles a desiccated corpse. After that, the body disintegrates completely into powder. Julian and Caitlin both note that no bacteria or disease known to medical science causes a body to continue accelerating a host's tissue decay after death. Barry describes the process of phasing by saying that he vibrates at the natural frequency of air. This puts his cells into an excited state that let him move through solid objects. He does this by connecting his body with the air, feeling everything around him and thinking of becoming pure electricity. One of the DNA elements found on Julio Mendez's body is consistent with an element found in the husks Julian Albert created as Alchemy. This leads him to conclude that the metahuman killer was one that he created. Joanie Horton says she doesn't drink coffee since she learned that hot roasted coffee beans carry cancer-causing levels of acrylamide. In the early stages of the death-touch, the victim experiences a fever (Iris' temperature was 104 degrees Fahrenheit) and elevated heart-rate. At that point, the decay spreads to her subcutaneous tissue. Cisco hits upon the idea of using focused cold to slow Iris' decay. Caitlin fears that she lacks that fine a control, however, and there's additional risks in failing to keep the process continuous. Too high a temperature and the decay will spread. Too low a temperature and they risk losing Iris' arm to frostbite or killing the nerve endings. In quantum mechanics, the daughter universe theory tells us that for every decision you make, a universe exists where you don't make that decision. Julian determines that the way the death touch works is that it causes the blood to attack the cells in her body. This is the precise opposite of the way that Barry's blood causes his body's cells to regenerate damage. He theorizes that introducing speedster blood into Clive Yorkin's system will negate his powers. Wally: So this is it, huh? Barry: Yeah. This is the starting line to our race. Cisco set up censors all along the course and he'll be tracking your speed all the way to the finish line on the other side of town. Wally: No, I meant this is it - the day the greatest upset in speedster history goes down. Barry:Wally, man, this isn't about winning or losing. Okay? This is about training. So you can get faster and beat Savitar and save Iris. Wally: (nodding) Yeah. Which I'm going to do! Wally: But first I'm going to make you eat my dust. I'm sorry. Barry: Okay. You know there's a reason they call me The Fastest Man Alive? Joe: Do I know you? Clive: You don't remember me? You and your cronies had a very fun time ruining my life. Not gonna let you do that this time around. Joe: I think you have the wrong guy. Clive: No, no. You're the Joe West I remember. Look a lot more full of life now, though. But don't worry. I can change that. Julian: (sarcastically) Well, that went swimmingly. Caitlin: Joe's right. We should have told him before now. Julian: What you should have told him is that I'm the one responsible. That the meta trying to kill him is one that I created. Caitlin: Julian, you can't change what happened to you. It's not your fault. Julian: You keep saying that, but it IS my fault! People are responsible for their own actions. To say otherwise is just... it's just a way to make yourself feel better. Caitlin: Is that what you think I'm doing? Making excuses for things I've done in the past? Caitlin:(scoffs) You know, I'm really starting to regret bringing you in here. Barry: Look, when I got these powers, I - uh... I was really lucky in a weird way. You know? I had a lot of people helping me through all of this. I had Wells. Both of them. And Jay. And Zolomon. I mean. two of them turned out to be bad guys but they were good teachers who really taught me how to use my powers. I just don't think I've been that for you yet. Barry: No. That's not it. It's- I- I've been letting you coast by on your raw talent, which you have a lot of. But teaching is a lot more than just doing something and expecting you to follow. It's about inspiring and empowering you to use your gifts to succeed on your own. That's what I need to do. That's what I'm going to do from now on.So the next time you're out there and you're alone, you will win. Deal? Caitlin: (scared) Just a little bit longer and she's dead. (Killer Frost's voice) How's that for changing the future? Julian: I know who you are Caitlin, and you do not want to do this! Caitlin: This is who I am. You said it. It's time for me to take responsibility for my actions. Time for me to own who I really am. Julian: Who you are is Caitlin Snow! I know first hand the battle going on inside of you. I know what it feels like. When it happened to me, I lost! All right? I was weak and I let it win. And I did - I did horrible things to a lot of good people. And you don't have to do that. You are not going to do that! You're stronger than I am, Caitlin. You're far stronger than I am. You're one of the strongest people I've ever known! You can win this fight. Julian: Iris needs your help now. Kid Flash: It worked! I did it! Kid Flash: (in mock surprise) Oh! What?! Look at that! Kid Flash: Your powers are neutralized, Yorkin. Financial wagering was made illegal on Earth 19 following an incident involving Vice President Al Capone. The Al Capone of Earth One was seen on L208. Abraham Lincoln is on the $100 bill on Earth 19. The restaurant where the first murder occurs - Luigi's - seems to be the restaurant mentioned in the news feed from the future in 310. The one that reopened after a murder. Barry realizes all of the murder victims were cops in The Flashpoint reality. Cecile Horton's daughter Joanie is a student at Coast University. Presumably this is located in Coast City. She has not chosen a major and is a Kid Flash fangirl, declaring that he is the only thing she misses about Central City. Iris tells Joe about the future Barry saw in 309. Cisco is able to use his Vibe powers to get visions of alternate realities, such as Flashpoint, by focusing upon a person as they think about that reality. Barry has never tried using his powers to lend his speed to a large object and enable it to phase before this episode. He manages to make an entire high-speed train intangible. Barry says "Run, Wally, Run." to Wally. Wally phases for the first time. One Yorkin's blood was stabilized, Julian was able to use it to make an antidote to reverse the death touch. Julian notes there is still one husk meta created by Alchemy unaccounted for. Caitlin asks Julian out for a drink. He accepts. At the end of the episode, Jesse Quick arrives through a breach and tells Wally that Grodd has kidnapped her father and taken him to Gorilla City. Cisco sees a scene from The Flashipoint universe. Again, we have Iris being placed in danger to give Barry, Wally and Joe angst. The idea of a power being inherently evil is troublesome enough without it being applied to the one woman with powers on the show's ensemble. Having the pep-talk that keeps her from going over the edge come from her current love interest doesn't help matters, though it IS well acted. A lot of the drama in this episode could have been avoided had Team Flash finally learned the lesson about NOT LYING TO EACH OTHER EVEN IF THEY THINK IT IS FOR A GOOD REASON! Another episode where the excellent ensemble acting salvages an otherwise unremarkable script. I appreciate the craft of Danielle Panabaker and Tom Felton's performances even as I struggle with the implications of Caitlin being saved by the promise of love with Julian ala Frozen. The villain of the week is well realized and the conflict between the various Team Flash members doesn't seem forced, though the "We need to be honest with each other" lesson is incredibly old at this point. And the Wally/Barry relationship has rarely been handled this well.